Dive instructor Brian Daga at Skull Island, The Solomon Islands. It’s not everyday that you meet the great grandson of a great warrior king. I only discovered Brian Daga was a son of kings when I started asking him questions about human skulls. 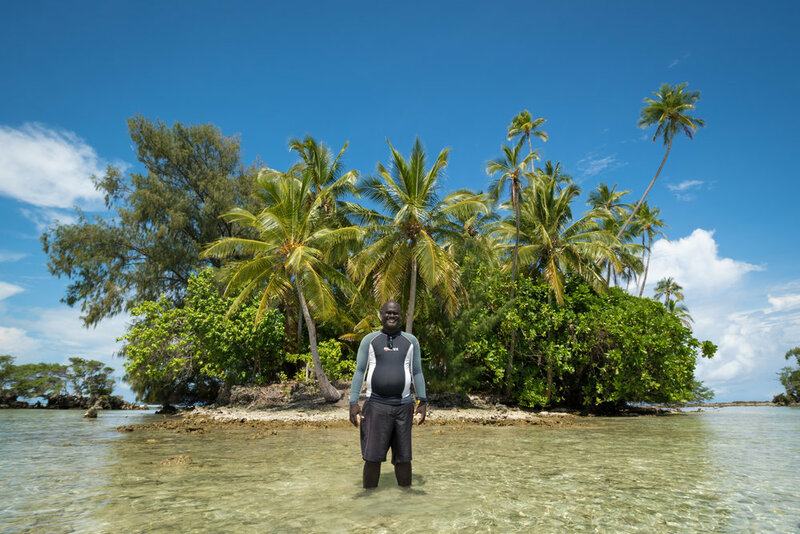 He works for the local dive shop in Munda in the Western Province of the Solomon Islands. He speaks with a soft voice and has a gentle, warm smile. When he goes diving, he likes to dive deep so he can share the world of sharks with adventure-driven foreigners, who pass through his island. 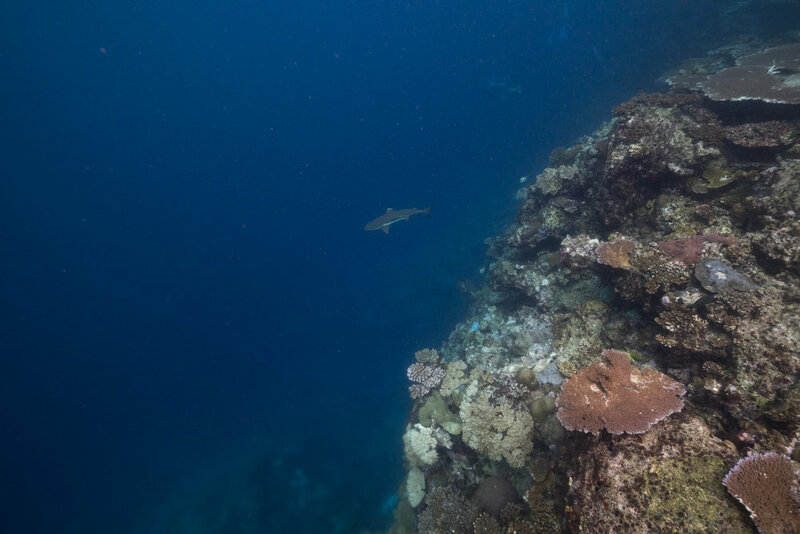 Munda boasts healthy shark populations: on every dive you see a shark, and in the shallows juvenile sharks reside, fleeing as soon as they see our inquisitive form looming in the shadows. A black tip reef shark patrolling the depths of a reef. Brian looks at peace under the water as he searches constantly for these great sea predators. (He exudes tranquillity, rather than the fiery brawn of his mighty warrior ancestors. I simply cannot imagine him holding a weapon). We have just finished diving with him at the majestic Mbigo Mbigo reef, which flanks a coral island wall topped by towering palm trees. We first went diving with Brian about ten years ago, and have returned today (11th May 2017) to capture on film the beauty of this underwater world. However, we notice that this place has changed. While places like Mbigo Mbigo are still vibrant, some areas of the reef look like they have declined or are under pressure, perhaps from nutrient load of run off from logging and crown of thorns. Coral bleaching at Mbigao Mbigao Reef. On one part of the reef wall, the intricate fingers of branching corals have been tainted by coral bleaching. However, co-director, James Sherwood, whispers to me on the boat after the dive that the temperature of the water will soon drop and should ‘hopefully’ ease the impact. Let us hope so. 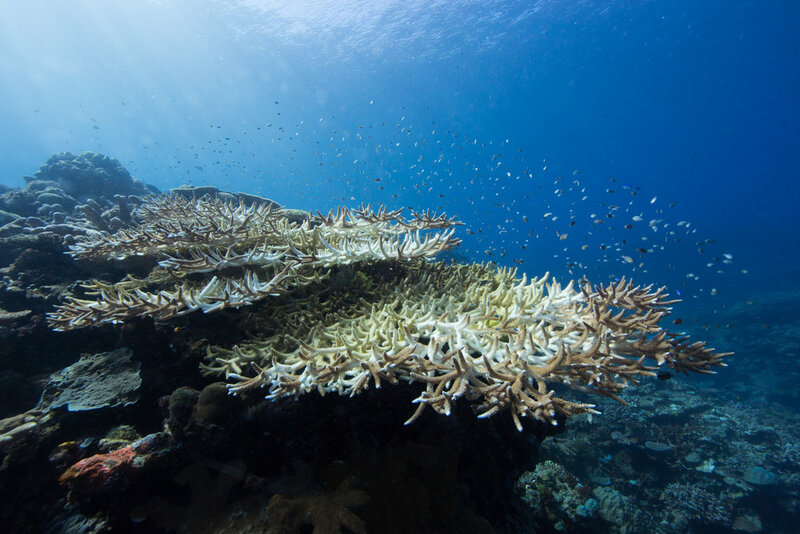 It has become common knowledge that reefs around the world have suffered from mass coral bleaching events. However, there is hope for the world’s remote reefs, which are still covered with healthy populations of grazing fish, like here in the Solomon Islands. This is because there is a symbiotic relationship with these creatures. The wrasses and parrot fish help graze the weak corals, giving them the nurture and care the corals need to recover. In return, the corals give these fish shelter and places to hide from the predators they fear. It is remarkable to see a place still as vibrant as this, since there are few places in the world where you can still see schools of grazing fish like parrot fish, and other larger pelagic fish like jacks, up against the shoreline, or small reef sharks, lurking in the reef shallows. Healthy corals at Mbigo Mbigo Reef. We just hope that more foreigners with a conservation mind-set come to visit this place to balance out the in-flow of those who have come here for a quick buck. We have noticed other Australians flying in and out of the Solomon Islands. However, they are not all tourists. Some come with promises of riches in exchange for extracting resources. Indeed, the town’s central lodge hosts a strange mix of my fellow country people - loggers, prospective miners, construction workers, dive tourists and the occasional conservationist. This strange mix of people share the same space, and listen to the thumping of disco music until the early hours of the morning. Brian would prefer it if only those who seek to explore and appreciate his home, his sea, and his culture came to visit. 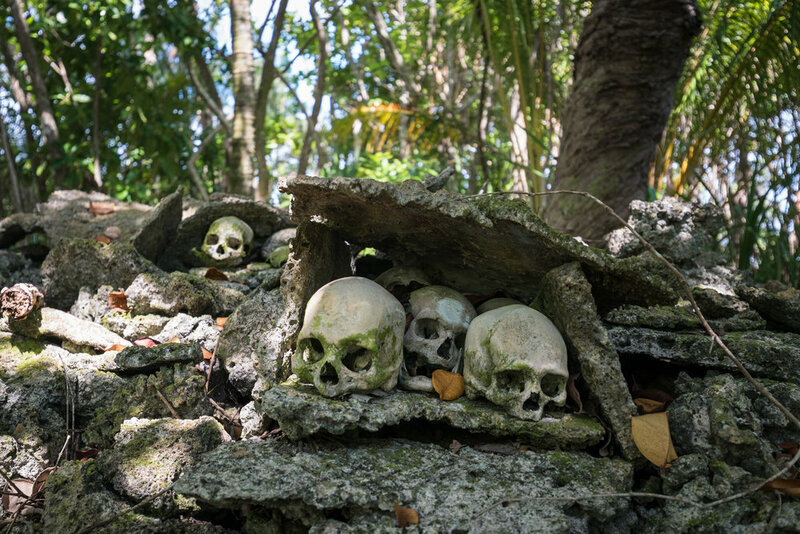 The skulls of Brian Daga's ancestors at Skull Island. Away from the hustle of the regional village, Brian takes us to a sacred place, a quieter place, away from culture shock that the resource era has brought with it. We park our boat beside the clear waters of Skull Island, wade through the shallows and we walk through its jungle to the centre, passing by a large man-made bowl full of water: Brian says that legend has it that if you tip out the water, then the wind and rain will come. Soon, we arrive in the middle of the island at a shrine created to remember the warriors of Munda. The shrine is protected from the sea elements by the canopy of jungle. The mound is made of broken coral stones with edifices fashioned into the top. Inside those edifices are human skulls, and shell money is scattered around the shrine. However, Brian says there used to be many more coins. Sadly, the shell money has been stolen by thieves. Some of the skulls have cracks in the top of the skulls – perhaps old war wounds? Brian tells us that the first skulls that greet you as you enter this sacred burial site are the skulls of chiefs, including the famous King Hiquava, Brian’s great grandfather. James diving at Mbigo Mbigo Reef with his underwater housing, before it flooded. Brian says that King Hiquava was known as a legendary warrior during the days when various clans would clash to test each other's strength and might. Indeed, legend has it that once the King went to Chisol where he was alone and was surrounded by an army of warriors. Then, he performed the ritual that all triumphant warriors performed; he buried each of the warriors in dirt up to their necks, cut off their heads and took his prizes of war home to show his people. King Hiquava was a proud chief. His life soon came to an end, not because he was weak or that he wanted to leave his people, but because the missionaries had arrived. They had arrived with their new God and were stealing the cultural pride and traditions of his people. So, as an act of worship to the spirits, he nobly killed himself. The missionaries relocated his head along with the other heads of his clan’s warriors from Munda to here on Skull Island, essentially placing his remains out of sight, and out of mind. As I look on at the ominous, mysterious skulls, I find myself muttering an apology to King Hiquava. My own people from Australia have ensured that this cultural shock will never end. As I think about the damage my culture has done, Brian hospitably invites us to take photographs of his sacred island. He has been kind to welcome us here. As we take a photograph of the skulls, I imagine what King Hiquava’s spirit might be thinking, looking down on us. Indeed, I wonder just how welcome we truly are. The photograph of Skull Island, which cost us our underwater housing. Before we leave, I ask Brian if he minds if I take a photograph of him standing in the shallows in front of Skull Island for a blog article for ‘The Map to Paradise’. He agrees. So, we take a photo, then James decides to take one last underwater shot for the day – a half-in, half-out shot of Skull Island. The island, sprouting green palm treetops and surrounded by crystal clear water, makes for an idyllic photograph. The water is only about 10 centimetres deep, so it should be easy for James to get the photograph he is after. However, as James goes to take the photo, suddenly he calls out that his housing is starting to flood! I rush to help him. I hold the port side upside down to try keep the water away from the camera and electrical circuits. James unscrews the port. He let’s the water gush out. The camera settings say ‘error’ and then the camera dies. James is confused as to what happened, as he is always careful. He laments that this has never happened before, and we joke with despair that it is the spirit of the great King Hiquava and the other ancestral spirits that live on this island that willed the incident to occur. Indeed, Brian says that only a week before, another visitor took photographs of Skull Island and when they returned to shore to look at them, their photographs had vanished. Gone, just like King Hiquava and his old tradition of head hunting. The lush seascape of the Solomon Islands. Later that night as the sun goes down, we are sitting with a friend on a wharf, listening to the tropical buzz of insects and soaking in the magic of the green-tinged sea and the islands covered in trees and shadows. (Our friend, who has travelled all the way from the Philippines where she resides, was with us earlier in the day when our housing flooded). Together, we watch a blood moon rise. Its mysterious form is bold, big, and ominous, and offers the perfect setting to tell a superstitious tale: our friend turns towards us and she says - did you know that, in the Philippines, a blood moon means something bad will happen? I look online and I discover that there are many ancient myths in many cultures around the world which signify a blood moon as a bad omen: tragically, perhaps, the blood moon is a sign that our fate has been sealed.